Every One to Possess a Sefer Torah. Size of the Scroll and Margin. Personal Copies of the Torah. The Pentateuch, written on a scroll of parchment. The Rabbis count among the mandatory precepts incumbent upon every Israelite the obligation to write a copy of the Pentateuch for his personal use. The passage "Now therefore write ye this song for you, and teach it the children of Israel" (Deut. xxxi. 19) is interpreted as referring to the whole Pentateuch, wherein "this song" is included (Sanh. 21b). The king was required to possess a second copy, to be kept near his throne and carried into battle (Deut. xvii. 18; Maimonides, "Yad," Sefer Torah, vii. 1, 2). One who is unable to write the scroll himself should hire a scribe to write it for him; or if he purchases a scroll he should have it examined by a competent Sofer. If a Jew inherits a scroll it is his duty to write or have written another. This scroll he must not sell, even in dire distress, except for the purpose of paying his teacher's fee or of de. fraying his own marriage expenses (Meg. 27a). Metal Case for Scroll of the Law. 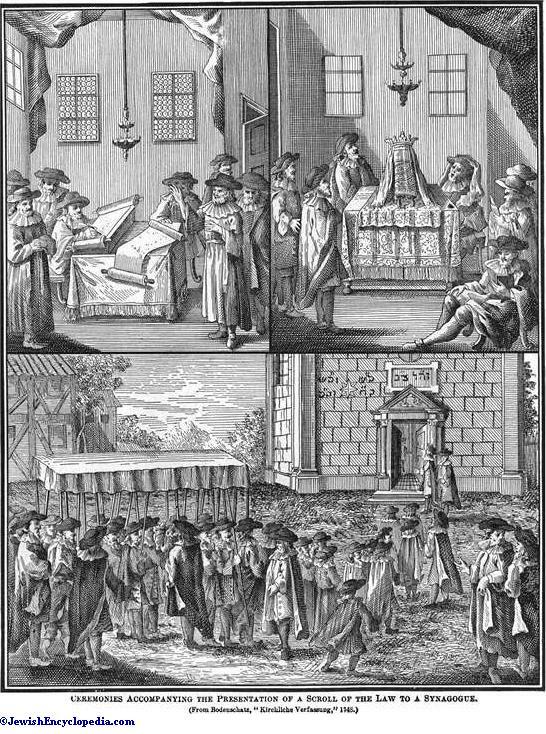 Ceremonies Accompanying the Presentation of a Scroll of the Law to a Synagogue. The Pentateuch for reading in public (see Law, Reading from the) must be written on the skin (parchment) of a clean animal, beast or fowl (comp. Lev. xi. 2 et seq. ), though not necessarily slaughtered according to the Jewish ritual; but the skin of a fish, even if clean, can not be used (Shab. 108a). The parchment must be prepared specially for use as a scroll, with gallnut and lime and other chemicals that help to render it durable (Meg. 19a). In olden times the rough hide was scraped on both sides, and thus a sort of parchment made which was known as "gewil." 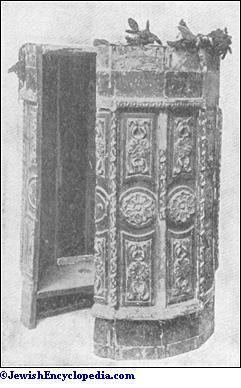 Later the hide was split, the outer part, of superior quality, called "ḳelaf," being mostly used for making scrolls of the Law, while the inner and inferior part, called "doksosṭos," (= δύσχιστος), was not employed for this purpose. The writing was inscribed on the outer or hair side of the gewil, and on the inner or flesh side of the ḳelaf (Shab. 79b). Every page was squared, and the lines were ruled with a stylus. Only the best black ink might be used (see Ink), colored ink or gilding not being permitted (Massek, Soferim i. 1). 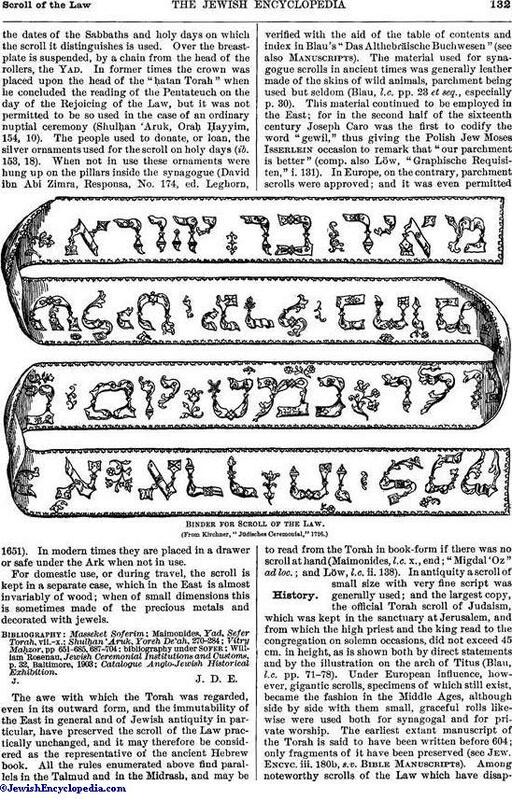 The writing was executed by means of a stick or quill; and the text was in square Hebrew characters (ib.). The width of the scroll was about six handbreadths (= 24 inches), the length equaling the circumference (B. B. 14a). The Baraita says half of the length shall equal the width of the scroll when rolled up (Soferim ii. 9). The length of the scroll in the Ark was six handbreadths, equal to the height of the tablets (B. B. l.c.). Maimonides gives the size of the regular scroll as 17 fingers (= inches) long (see below), seventeen being considered a "good" number ( = 17). Every line should be long enough to contain thirty letters or three words equal in space to that occupied by the letters . The lines are to be neither too short, as in an epistle, nor too long, involving the shifting of the body when reading from beginning to end. The sheet ("yeri'ah") must contain no less than three and no more than eight columns. A sheet of nine pages may be cut in two parts, of four and five columns respectively. The last column of the scroll may be narrower and must end in the middle of the bottom line with the words (Men. 30a). Scroll of the Law from China. The margin at the bottom of each page must be 4 fingerbreadths; at the top, 3 fingerbreadths; between the columns, 2 fingers' space; an allowance being made of 1 fingerbreadth for sewing the sheets together. Maimonides gives the length of the page as 17 fingers, allowing 4 fingerbreadths for the bottom and 3 fingerbreadths for the top margin, and 10 fingerbreadths for the length of the written column. In the scroll that Maimonides had written for himself each page measured 4 fingers in width and contained 51 lines. The total number of columns was266, and the length of the whole scroll was 1,366 fingers (= 37.34 yds.). Maimonides calculates a finger-measure as equal to the width of 7 grains or the length of 2 ("Yad," l.c. ix. 5, 9, 10), which is about 1 inch. The number of lines on a page might not be less than 48 nor more than 60 (ib. vii. 10). The Baraita, however, gives the numbers 42, 60, 72, and 98, based respectively on the 42 travels (Num. xxxiii. 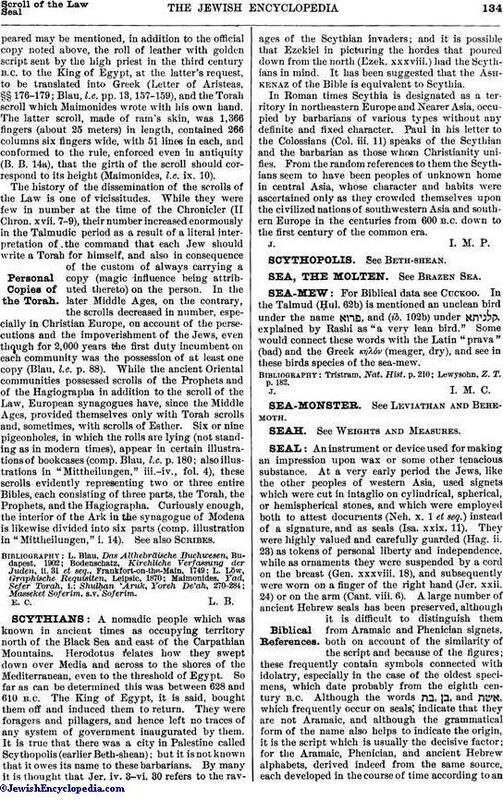 3-48), 60 score thousand Israelites (Num. xi. 21), 72 elders (ib. verse 25), and 98 admonitions in Deuteronomy (xxviii. 16-68), because in each of these passages is mentioned "writing" (Soferim ii. 6). (At the present day the forty-two-lined column is the generally accepted style of the scroll, its length being about 24 inches.) The space between the lines should be equal to the size of the letters (B. B. 13a), which must be uniform, except in the case of certain special abnormalities (see Small and Large Letters). The space between one of the Pentateuchal books and the next should be four lines. Extra space must be left at the beginning and at the end of the scroll, where the rollers are fastened. Nothing may be written on the margin outside the ruled lines, except one or two letters required to finish a word containing more than twice as many letters. Some scribes are careful to begin each column with initial letters forming together the words ("by his name JAH"; Ps. lxviii. 4), as follows: (Gen. i. 1), (ib. xlix. 8), (Ex. xiv. 28), (ib. xxxiv. 11), (Num. xxiv. 5), (Deut. xxxi. 28). Other scribes begin all columns except the first with the letter "waw"; such columns are called "wawe ha-'ammudim" = "the waw columns" (see Scribes). It is the scribe's duty to prepare himself by silent meditation for performing the holy work of writing the Pentateuch in the name of God. He is obliged to have before him a correct copy; he may not write even a single word from memory; and he must pronounce every word before writing it. Every letter must have space around it and must be so formed that an ordinary schoolboy can distinguish it from similar letters (Shulḥan 'Aruk, Oraḥ Ḥayyim, 32, 36; see Taggin). The scroll may contain no vowels or accents; otherwise it is unfit for public reading. The scroll is not divided into verses; but it has two kinds of divisions into chapters ("parashiyyot"), distinguished respectively as "petuḥah" (open) and "setumah" (closed), the former being a larger division than the latter (Men. 32a). Maimonides describes the spaces to be left between successive chapters as follows: "The text preceding the Petuḥah ends in the middle of the line, leaving a space of nine letters at the end of the line, and the petuḥah commences at the beginning of the second line. If a space of nine letters can not be left in the preceding line, the petuḥah commences at the beginning of the third line, the intervening line being left blank. The text preceding the setumah or closed parashah ends in the middle of the line, a space of nine letters being left, and the setumah commencing at the end of the same line. If there is no such space on the same line, leave a small space at the beginning of the second line, making together a space equal to nine letters, and then commence the setumah. In other words, always commence the petuḥah at the beginning of a line and the setumah in the middle of a line" ("Yad," l.c. viii. 1, 2). Maimonides gives a list of all the petuḥah and setumah parashiyyot as copied by him from an old manuscript in Egypt written by Ben Asher (ib. viii., end). Asheri explains the petuḥah and setumah differently, almost reversing the method. The general practise is a compromise: the petuḥah is preceded by a line between the end of which and the left margin a space of nine letters is left, and commences at the beginning of the followingline; the setumah is preceded by a line closing at the edge of the column and commences at the middle of the next line, an intervening space of nine letters being left (Shulḥan 'Aruk). 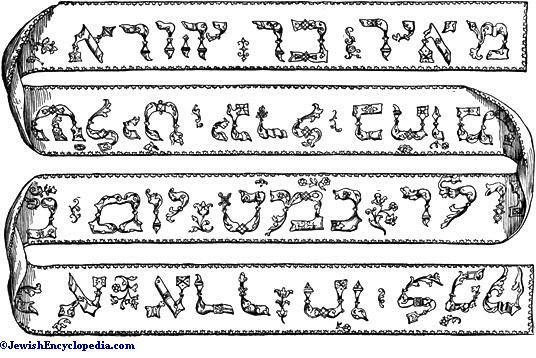 The scroll must be written in accordance with the Masoretic Ketib, the abnormalities of certain letters being reproduced (See Small and Large Letters). If the final letters are written in the middle of a word, or if their equivalents are written at the end, the scroll is unfit for public reading (Soferim ii. 10). Scrupulous care must be taken in writing the Names of God: before every name the scribe must say, "I intend to write the Holy Name"; otherwise the scroll would be unfit ("pasul") for public reading. When the scribe has begun to write the name of God he must not be interrupted until he has finished it. No part of the name may, extend into the margin outside the rule. If an error occurs in the name, it may not be erased like any other word, but the whole sheet must be replaced and the defective sheet put in the genizah. When the writing is set aside to dry it should be covered, with a cloth to protect it from dust. It is considered shameful to turn the writing downward ('Er. 97a). If an error is found in the scroll it must be corrected and reexamined by a competent person within thirty days; if three or four errors are found on one page the scroll must be placed in the genizah (Men. 29b). The sheets are sewed together with threads made of dried tendons ("gidin") of clean beasts. The sewing is begun on the blank side of the sheets; the extreme ends at top and bottom are left open to allow stretching. The rollers are fastened to the ends of the scroll, a space of two fingerbreadths being left between them and the writing. Every sheet must be sewed to the next; even one loose sheet makes the scroll unfit. At least three stitches must remain intact to hold two sheets together (Meg. 19a; Giṭ. 60a). If the scroll is torn to a depth of two lines, it may be sewed together with dried tendons or fine silk, or a patch may be pasted on the back; if the tear extends to three lines, the sheet must be replaced. If the margin or space between the lines is torn, it may be sewed together or otherwise repaired. Care must be taken that every letter is in its proper place and that the needle does not pierce the letters. A scroll written by a non-Jew must be put aside in the genizah; one written by a heretic ("apikoros") or sectarian Jew ("min") must be burned, as it is to be apprehended that he has wilfully changed the text (Giṭ. 45b). Breastplate for Scroll of the Law. Every one who passes a scroll must kiss its mantle. The scroll may not be kept in a bedroom (M. Ḳ. 25a). A scroll of the Law may lie on the top of another, but not under the scroll of the Prophets, which latter is considered inferior in holiness to the scroll of the Pentateuch (Meg. 27a). Decayed and worn-out scrolls are placed in the Genizah or in an earthen vessel in the coffin of a talmid-ḥakam (Ber. 26b). See also Manuscripts. The reverence with which the scroll of the Law is regarded is shown by its costly accessories and ornaments, which include a beautiful Ark as a receptacle, with a handsomely embroidered "paroket" (curtain) over it. The scroll itself is girded with a strip of silk and robed in a Mantle of the Law, and is laid on a "mappah," or desk-cover, when placed on the almemar for reading. The two rollers, "eẓ ḥayyim," are of hard wood, with flat, round tops and bottoms to support and protect the edges of the parchment when rolled up. The projecting handles of the rollers on both sides, especially the upper ones, are usually of ivory. 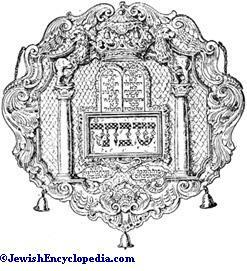 The gold and silver ornaments belonging to the scroll are known as "kele ḳodesh" (sacred vessels), and somewhat resemble the ornaments of the high priest. The principal ornament is the Crown of the Law, which is made to fit over the upper ends of the rollers when the scroll is closed. Some scrolls have two crowns, one for each upper end. Suspended by a chain from the top of the rollers is the breastplate, to which, as in the case of the crowns, little bells are attached. Lions, eagles, flags, and the Magen Dawid either chased or embossed, or painted, are the principal decorations. The borders and two pillars of Boaz and Jachin on the sides of the breastplate are in open-work. 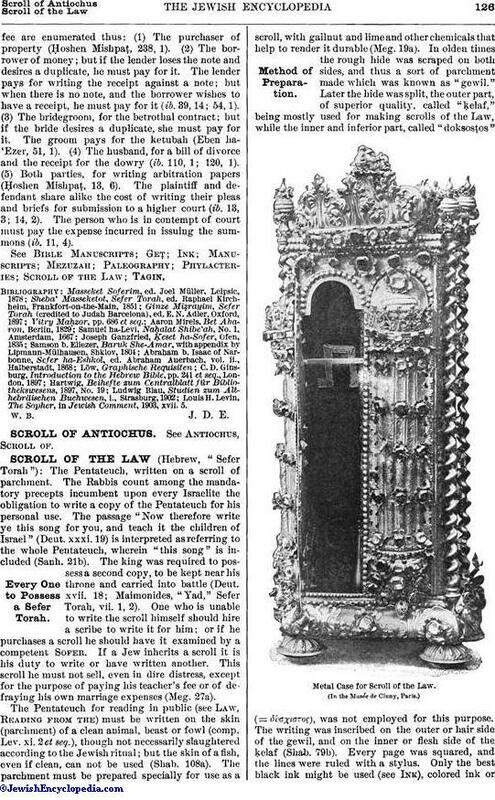 In the center there is often a miniature Ark, the doors being in the form of the two tablets of the Law, with the commandments inscribed thereon. 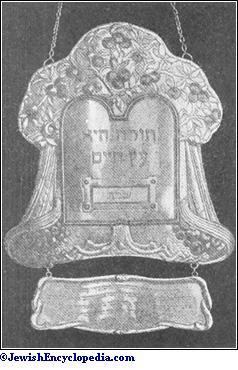 The lower part of the breastplate has a place for the insertion of a small plate, bearingthe dates of the Sabbaths and holy days on which the scroll it distinguishes is used. Over the breastplate is suspended, by a chain from the head of the rollers, the Yad. 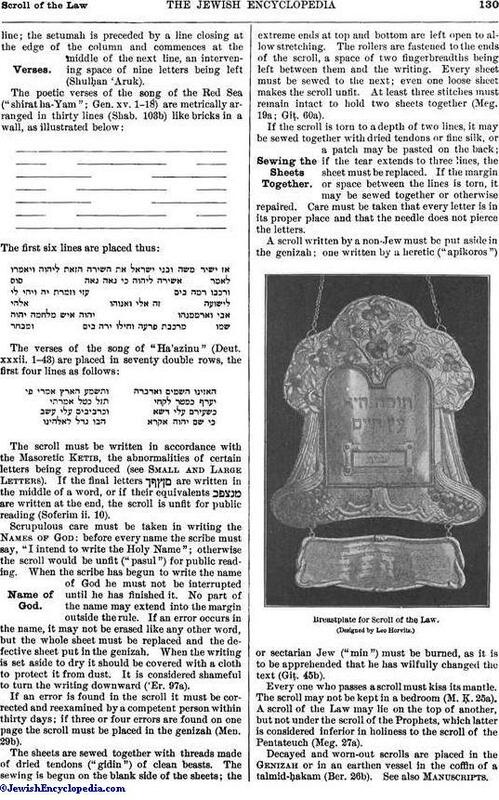 In former times the crown was placed upon the head of the "ḥatan Torah" when he concluded the reading of the Pentateuch on the day of the Rejoicing of the Law, but it was not permitted to be so used in the case of an ordinary nuptial ceremony (Shulḥan 'Aruk, Oraḥ Ḥayyim, 154, 10). The people used to donate, or loan, the silver ornaments used for the scroll on holy days (ib. 153, 18). When not in use these ornaments were hung up on the pillars inside the synagogue (David ibn Abi Zimra, Responsa, No. 174, ed. Leghorn, 1651). In modern times they are placed in a drawer or safe under the Ark when not in use. For domestic use, or during travel, the scroll is kept in a separate case, which in the East is almost invariably of wood; when of small dimensions this is sometimes made of the precious metals and decorated with jewels. Binder for Scroll of the Law. 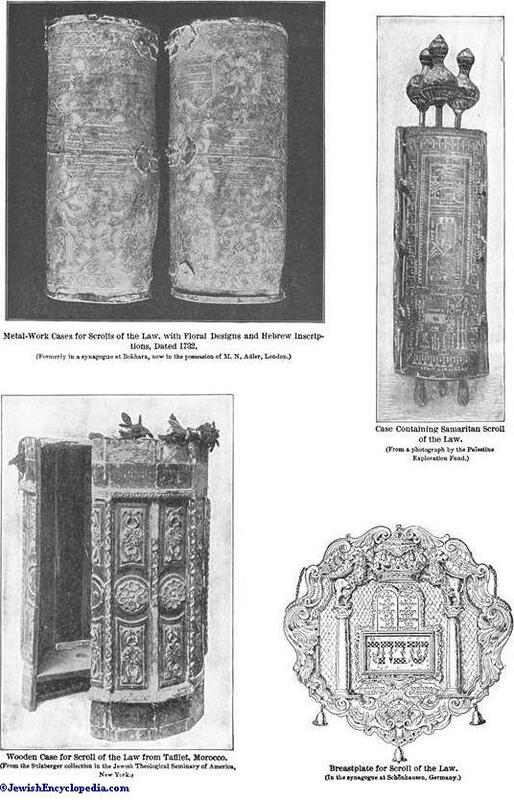 Metal-Work Cases for Scrolls of the Law, with Floral Designs and Hebrew Inscriptions, Dated 1732. Wooden Case for Scroll of the Law from Tafilet, Morocco. Case Containing Samaritan Scroll of the Law. 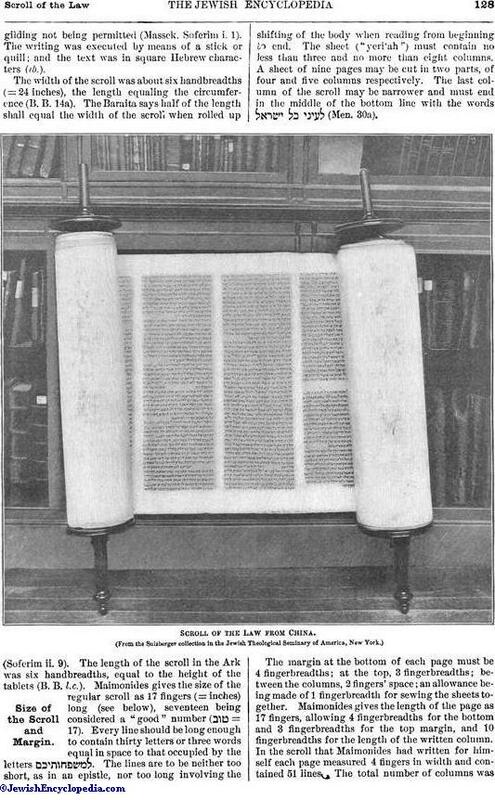 The awe with which the Torah was regarded, even in its outward form, and the immutability of the East in general and of Jewish antiquity in particular, have preserved the scroll of the Law practically unchanged, and it may therefore be considered as the representative of the ancient Hebrew book. All the rules enumerated above find parallels in the Talmud and in the Midrash, and may be verified with the aid of the table of contents and index in Blau's "Das Althebräische Buchwesen" (see also Manuscripts). 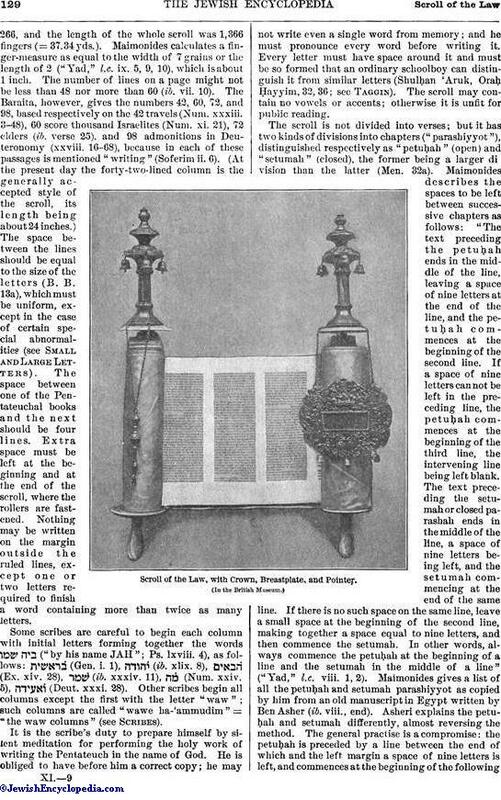 The material used for synagogue scrolls in ancient times was generally leather made of the skins of wild animals, parchment being used but seldom (Blau, l.c. pp. 23 et seq., especially p. 30). 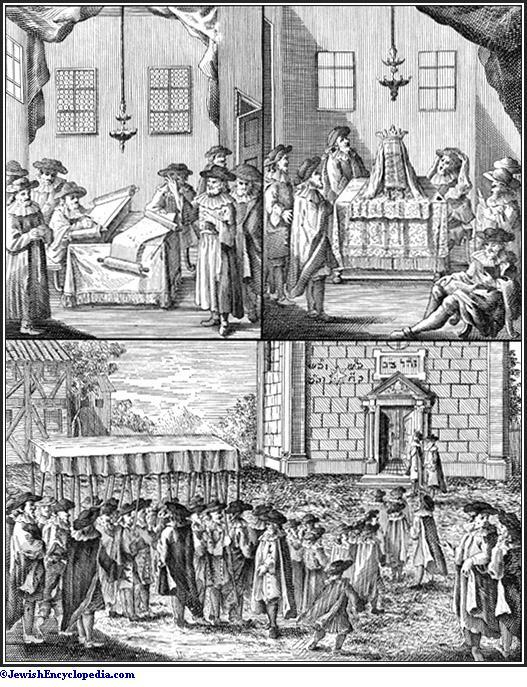 This material continued to be employed in the East; for in the second half of the sixteenth century Joseph Caro was the first to codify the word "gewil," thus giving the Polish Jew Moses Isserlein occasion to remark that "our parchment is better" (comp. also Löw, "Graphische Requisiten," i. 131). 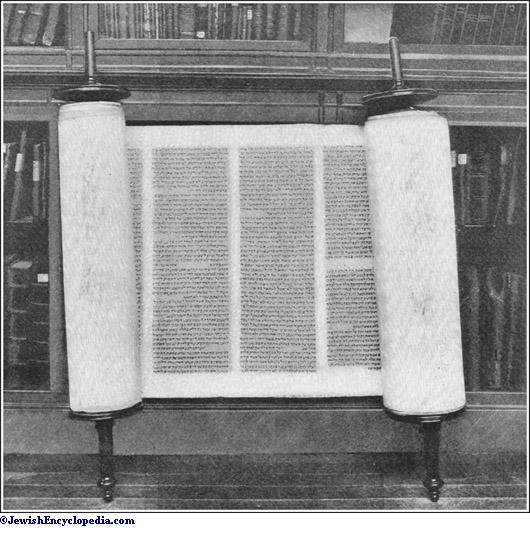 In Europe, on the contrary, parchment scrolls were approved; and it was even permitted to read from the Torah in book-form if there was no scroll at hand (Maimonides, l.c. x., end; "Migdal 'Oz" ad loc. ; and Löw, l.c. ii. 138). 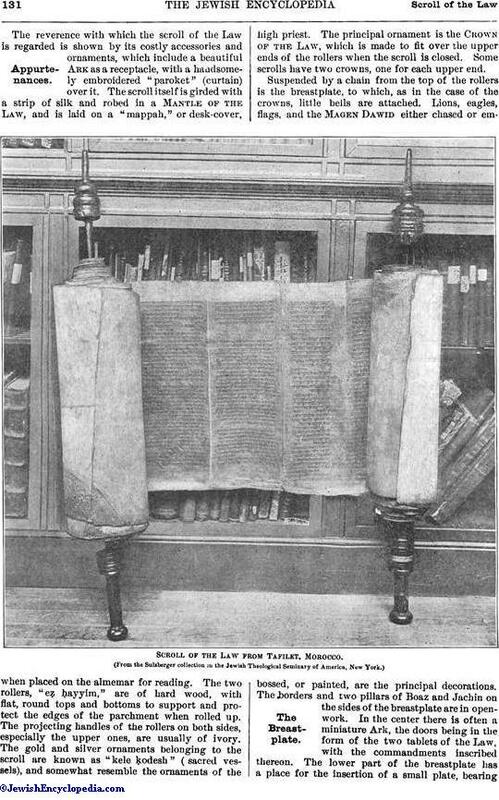 In antiquity a scroll of small size with very fine script was generally used; and the largest copy, the official Torah scroll of Judaism, which was kept in the sanctuary at Jerusalem, and from which the high priest and the king read to the congregation on solemn occasions, did not exceed 45 cm. in height, as is shown both by direct statements and by the illustration on the arch of Titus (Blau, l.c. pp. 71-78). Under European influence, however, gigantic scrolls, specimens of which still exist, became the fashion in the Middle Ages, although side by side with them small, graceful rolls likewise were used both for synagogal and for private worship. The earliest extant manuscript of the Torah is said to have been written before 604; only fragments of it have been preserved (see Jew. Encyc. iii. 180b, s.v. Bible Manuscripts). Among noteworthy scrolls of the Law which have disappeared may be mentioned, in addition to the official copy noted above, the roll of leather with golden script sent by the high priest in the third century B.C. to the King of Egypt, at the latter's request, to be translated into Greek (Letter of Aristeas, §§ 176-179; Blau, l.c. pp. 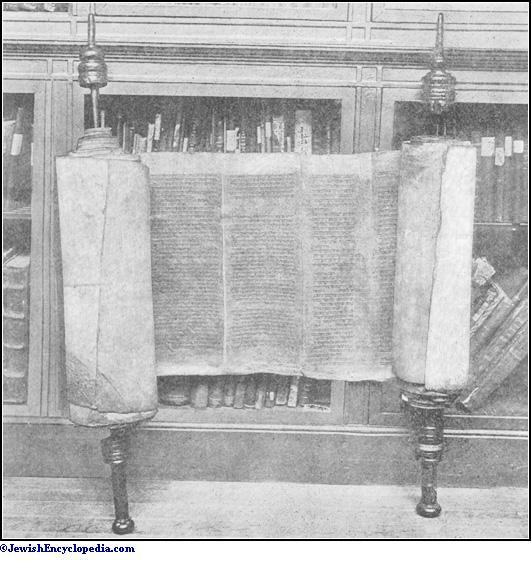 13, 157-159), and the Torah scroll which Maimonides wrote with his own hand. The latter scroll, made of ram's, skin, was 1,366 fingers (about 25 meters) in length, contained 266 columns six fingers wide, with 51 lines in each, and conformed to the rule, enforced even in antiquity (B. B. 14a), that the girth of the scroll should correspond to its height (Maimonides, l.c. ix. 10). The history of the dissemination of the scrolls of the Law is one of vicissitudes. While they were few in number at the time of the Chronicler (II Chron. xvii. 7-9), their number increased enormously in the Talmudic period as a result of a literal interpretation of the command that each Jew should write a Torah for himself, and also in consequence of the custom of always carrying a copy (magic influence being attributed thereto) on the person. In the later Middle Ages, on the contrary, the scrolls decreased in number, especially in Christian Europe, on account of the persecutions and the impoverishment of the Jews, even though for 2,000 years the first duty incumbent on each community was the possession of at least one copy (Blau, l.c. p. 88). 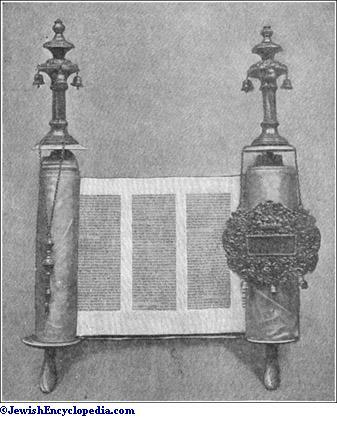 While the ancient Oriental communities possessed scrolls of the Prophets and of the Hagiographa in addition to the scroll of the Law, European synagogues have, since the Middle Ages, provided themselves only with Torah scrolls and, sometimes, with scrolls of Esther. Six or nine pigeonholes, in which the rolls are lying (not standing as in modern times), appear in certain illustrations of bookcases (comp. Blau, l.c. p. 180; also illustrations in "Mittheilungen," iii.-iv., fol. 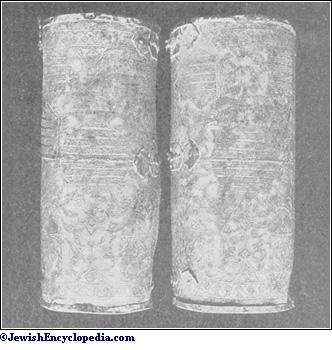 4), these scrolls evidently representing two or three entire Bibles, each consisting of three parts, the Torah, the Prophets, and the Hagiographa. Curiously enough, the interior of the Ark in the synagogue of Modena is likewise divided into six parts (comp. illustration in "Mittheilungen," i. 14). See also Scribes.